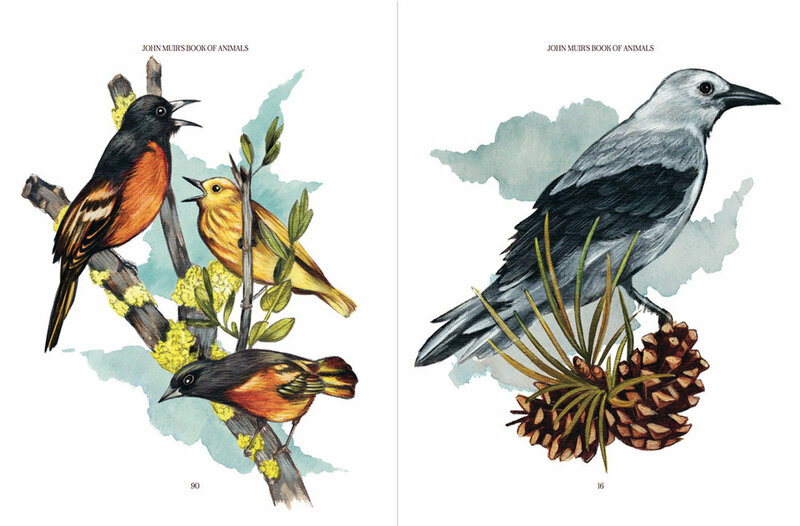 I was thrilled to create illustrations to accompany the writings of the great naturalist, John Muir for Diane Lee at Heyday Books. "Many of John Muir’s most vivid and memorable stories celebrate his encounters with animals. Whether breakfasting with deer, attempting to scare off a black bear, or musing upon the ferocity of ants, Muir looks upon the animal world with amazement and affection, and the power of his words, the freshness of his thinking, the keenness of his perceptions, and the depth of his passion continue to inspire the same in readers today. Drawing from longtime favorites such as Stickeen as well as from less familiar books, letters, articles, and journals, John Muir’s Book of Animals presents us with twenty-seven of Muir’s most compelling stories and vibrant descriptions. Sumptuous illustrations by Lisel Jane Ashlock add to our amazement and delight."